I’m fairly certain that, the next time I make the 3-hour trek to our closest IKEA, I’m going to have to splurge. $200 for a decent cowhide rug? I’m in. The organic shape and on-trend-yet-classic styling are too good to pass up. Although these rugs tend to be a bit on the smaller side, they work nicely layered on top of a larger, more neutral area rug. 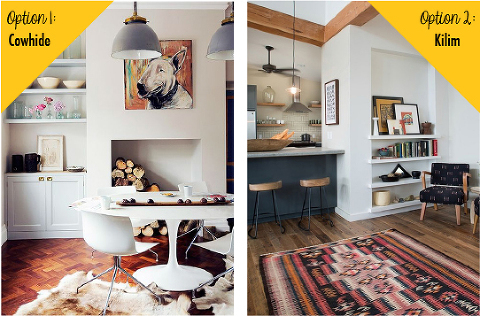 Kilim rugs are another on-trend-yet-classic look that I can’t get enough of lately. I think one of the most common misconceptions is that these often vintage rugs are too precious for everyday life. I think it’s quite the opposite though. All of that pattern and color go a long, long way in hiding dirt and stains. Here’s hoping IKEA comes up with a budget look-a-like soon!